Can I just say I will be so glad when this school year is over? There seems to be one activity after another going on these days, one meeting after another, with all the usual studying, deadlines and such still hanging over the girls’ heads. There’s less than a month left in the school year, and it feels like way too much is being crammed into these last few weeks. It’s exhausting for all of us. I won’t be making a side trip up to see my friend in Maine next August. Although she was welcoming, she will not only be having the bathroom remodeled at her house at the time, but will also be getting ready for her daughter’s wedding at the around the same time I would be there – not a good time for a houseguest. We’re both sad about not getting to see each other, but know we’ll manage a visit one of these days. And, just to keep things special, my MacBook has started to overheat, and is getting ready to fry itself again. I just had it repaired six months ago for this same thing, so am debating with myself now whether it’s worth it to repair again or if I should go ahead and buy a new one before this one dies and accept that I got a lemon when I bought it barely two years ago. I am not particularly happy with Apple right now (my new phone also had a glitch and has to be replaced). Reading: I am ashamed to admit that I did not pick up a book this week even though I’m almost through Over the Edge (down to suicides and murders). I did lots of other reading – magazines, blogs, etc. – but nothing out of a book. Listening to: Birds, lots and lots of birds this morning. And the trade winds blowing through the trees. It’s been a lovely, quiet morning here. Watching: We finished all the available episodes of Death in Paradise this past week, and started watching The Unbreakable Kimmy Schmidt last night. Love it! Tonight I’ll be watching more of Call the Midwife, Grantchester, and Mr. Selfridge. Cooking/baking: There’s still lots of Brett’s birthday cake left over, so no baking today. Brett made sweet bread french toast for breakfast this morning (I had cereal with soy milk and berries), and tonight’s dinner will be broiled stuffed tomatoes, salami, bread, mozzarella and grilled zucchini. Happy I accomplished last week: On Thursday, Brett and I ordered all of WenYu’s lei for graduation. They are gorgeous! She will be getting one each from her brother and sisters, one from her aunt and uncle, and one from her grandmother, as well as a haku (head wreath) from Brett and I. We also stopped at a local bike shop on Thursday and got Brett on the waiting list for a used bike (his birthday present), and we got our big monthly Costco shop done on Wednesday. Looking forward to next week: Hopefully we’ll have a calmer week than this last one! As far as I know there are no meetings or appointments scheduled, but that could of course change. Thinking of good things that happened: YaYu was elected president of her Key Club chapter for next year, and WenYu did well in her last track meet (although not well enough to go to State, which is fine with her). Although we ran a lot of errands that day, Brett said he still had a fantastic birthday (he was so surprised by the stop at the bike shop!). I rode the exercise bicycle twice every day this past week, and we put $17.47 in the change/$1 bill jar! Grateful for: So thankful for all the rain we’ve had recently. Unlike Portland, I love it when it rains here and for the rainbows that show up when it stops. Also, I’m very thankful for the terrific, friendly service I received from our phone service provider over the past few days – there was a problem with my new phone, and when they couldn’t remedy it they replaced the phone quickly and without question or hassle. Bonus Question: What are your biggest time wasters? I used to waste an extraordinary amount of time on Pinterest, but these days it’s Twitter. I enjoy reading others’ pithy comments, and it keeps me up to date on things I might not otherwise know. I also love playing Neko Atsume, the cat collecting game. I usually check the site several times a day to see which cats are visiting or have visited, and find out what gifts they’ve left for me. It’s a total waste of time, but fun (and addicting). How is your Sunday going? I hope you’ve all had a very good week! Great Sunday here. The garden is 3/4 in and rain is expected this week. Reading has been my “off time” sport. I highly recommend – Somewhere in France by Robson. WW1 and Downton Abbey combined. I can almost smell that lei in the photo. Gosh I miss those flowers! I have that book on my Kindle! So many other things piled up though and I sort of forgot about it, but will get it moved back on the list of things to read. 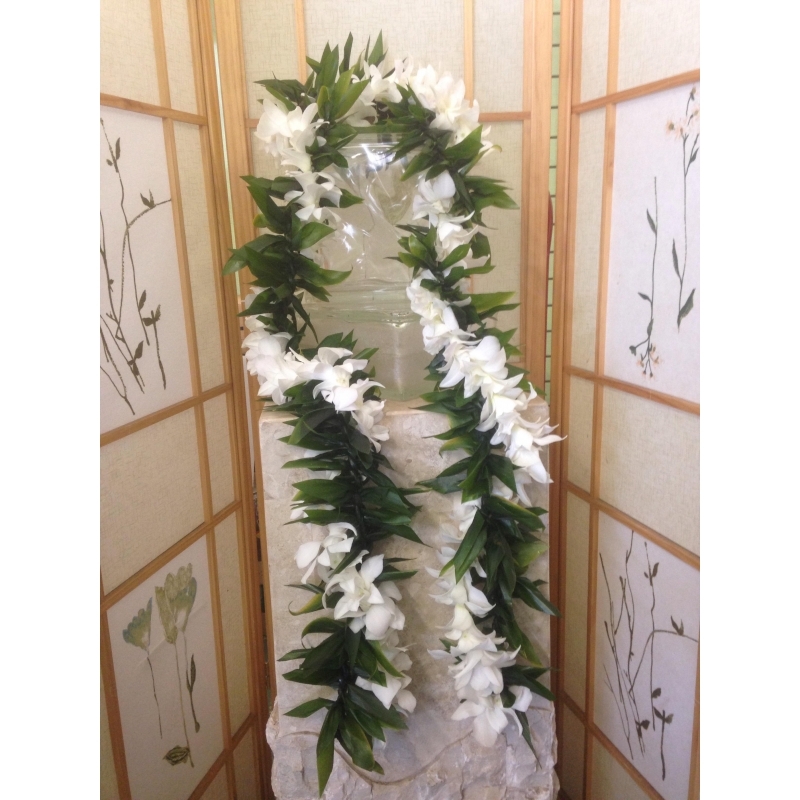 The florist had so many choices for lei – it was hard to choose. Our family was very generous, so we were able to purchase some really beautiful ones. Picture taking will be interesting – we will have to take pictures to show off each lei for family, then the one with them all stacked up to her ears! I go back & forth on school ending. On one hand – no soccer practice & no homework. .. hurrah! But, on the other, we have to do summer camps, and each week the schedule & locations are different, half the time they interfere with our work schedule, etc. But, we do have some fun summer trips coming up, so it could be worse. As for my Sunday, I spent today running a bunch of errands & getting the house as prepped as possible (food, laundry, bedding washed, etc) to make my husband’s life as easy as possible while I’m out of town. Heading to the airport in an hour or so for a flight to London. Summer vacation here is short, just June and July and then school starts again at the beginning of August (this past year it started at the end of July!). YaYu wanted to go to summer school, but doesn’t really need to, and we have our getaway to Oahu coming up in June, so looks like it will be another summer of relaxation, although YaYu is hinting that she might look for a job when we get back in June. We’ll see. At least your company sends you to interesting places when you have to travel!